Make our Creamy Curry Chicken Salad! 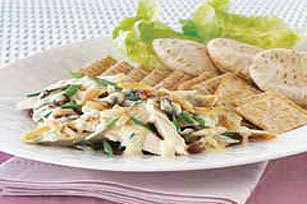 Add raisins, curry powder and almonds to turn a plain chicken salad into delightful Creamy Curry Chicken Salad. Serve with assorted crackers and mini pita halves. Or, serve in Boston or Red Leaf lettuce cups. Chop the OSCAR MAYER Deli Fresh Grilled Chicken Breast Strips; place in large bowl. Add 1/2 cup KRAFT Greek Vinaigrette Dressing, 1/2 cup ATHENOS Traditional Crumbled Feta Cheese, 1/3 cup PLANTERS Walnut Pieces and 1/4 cup each sliced green onions and sliced pitted kalamata olives; toss lightly. Cover and refrigerate until ready to serve. Recipe can easily be doubled to feed a larger group. Just prepare as directed, doubling all ingredients. Makes 8 servings.